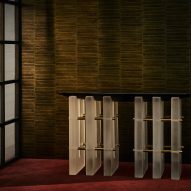 New York design studio Apparatus references an early 20th-century Viennese art movement with its latest offerings: tables with resin bases and ribbed porcelain lamps, which were unveiled at the Collective Design fair. 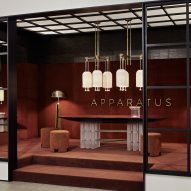 Co-founders Gabriel Hendifar and Jeremy Anderson debuted the collection during Milan design week in April, then presented it in full at the fair in New York earlier this month. The range includes the Segment tables, which come in sizes from small side pieces to large dining models. 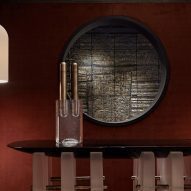 Each features a base made from standing blocks of translucent resin, supporting a lacquered top available in a range of rich colours. 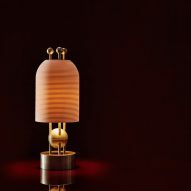 Bell-jar-shaped lamp shades made from ribbed porcelain typify the Lantern lighting series. 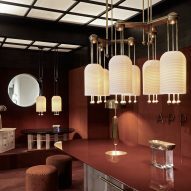 Pendants can be used individually or in combinations, featuring bronze fixtures that are also found in the floor and table versions. A major influence for the collection was the work of the Wiener Werkstätte – a collective of artists and designers working in Vienna at the beginning of the 1900s. 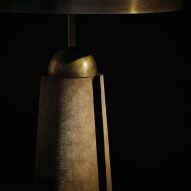 "As we began thinking about new pieces I found myself being drawn to the first 30 years of the 20th century, a period with a striking progression of ideas about modernity," said Hendifar. 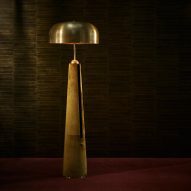 "Vienna at the turn of the century, Weimar Germany, Art Deco, Bauhaus, all propose ideas that feel enduringly relevant." 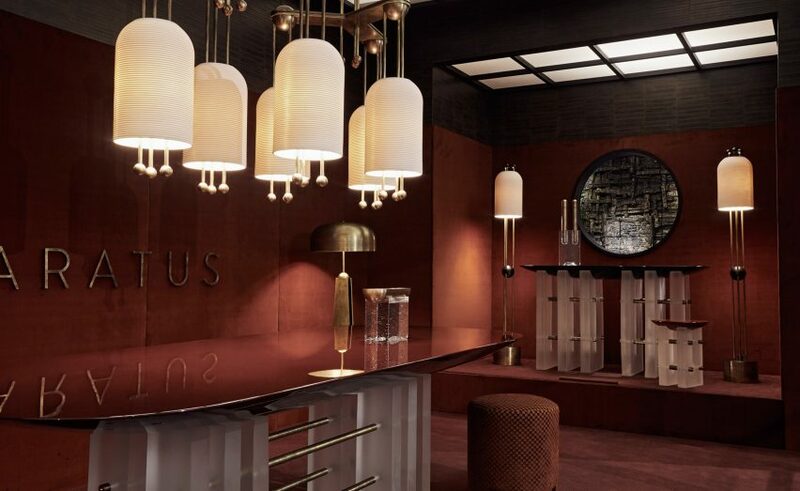 The group's principles included the creation of gesamtkunstwerk, or total artworks, which meant designing every element of a space from the architecture down to accessories. 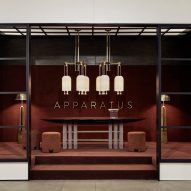 In this spirit, Apparatus created an installation at Collective Design that created the mood and atmosphere they envisioned for the products. 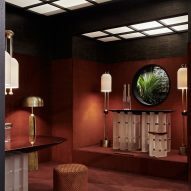 "One of the essential parts of designing new collections is imagining the context in which we will present them," Hendifar said, "the colour and mood of the rooms, how those rooms should make us feel, who lives in them, what they collect, what they wear." 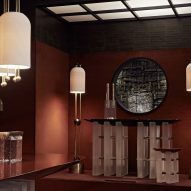 Fronted by gridded screens, and featuring rusty red walls and carpet, the pavilion was illuminated by the lamps and diffused light from the paned ceiling. 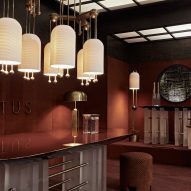 The collection will also be on show at the studio's appointment-only showroom on West 30th Street, which is being completely overhauled to exhibit the new designs. Collective Design took place 3-7 May 2017 at Skylight Clarkson Square, New York. 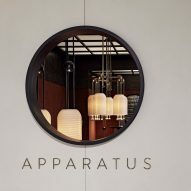 Apparatus' collection was one of Dezeen's six highlights from the show, along with an installation of electric wallpaper. Photography is by Adrian Gaut, unless stated otherwise.